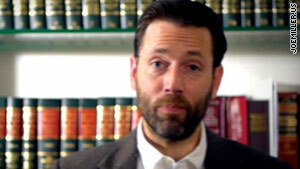 Joe Miller has the backing of the Tea Party Express in Alaska's GOP Senate primary on August 24. (CNN) -- Many voters may never have seen or heard of him, but Joe Miller is determined to make Republican Sen. Lisa Murkowski of Alaska the next victim of an angry, anti-incumbent movement. And helping him is the Tea Party Express. Miller, an attorney in Fairbanks, is little-known in Alaska. He has been endorsed by the Tea Party Express as a true "constitutional conservative" and by former Gov. Sarah Palin. Murkowski holds a GOP leadership post in the Senate but is also under fire for being a moderate. The Senate battle marks Miller's first statewide contest. In 2004, Miller ran for a seat in the state House of Representatives. He won the Republican primary but lost narrowly in the general election. Miller said he thinks he can prevail in this David and Goliath battle. "The Murkowski name is well-known, but it is not all that popular in this state," Miller told CNN. He also cited how sitting senators are vulnerable amid an anti-incumbent mood. Recent race results suggest Murkowski, whose father was an Alaska governor and former U.S. senator, might have reason to be concerned. In Utah, Tea Party activists helped deny Republican Sen. Bob Bennett a fourth term at the state's GOP convention last month. Even candidates favored by the Republican establishment have lost to Tea Party-backed candidates. Sharron Angle in Nevada and Rand Paul in Kentucky both won their respective GOP primaries with help from the movement. Tea Party Express spokesman Levi Russell recently told CNN the group will use people, money, ads and possibly a bus tour across Alaska to help Miller. Miller cited another factor that he believes will make it easier to unseat Murkowski in the August 24 primary: "She has no less than 300 times voted with the Democrats against the Republicans," he said. Congressional Quarterly analyses appear to support Miller's claim. One says that in key Senate votes in 2009, Murkowski voted with her party 70 percent of the time but against Republicans some 30 percent -- the highest of any Republican senator up for re-election. Congressional Quarterly's analysis, from 2003 to 2008, suggests that Murkowski has increasingly voted with Democrats over the years. Yet Murkowski's campaign is emphatic about the senator's conservative bona fides. In a statement to CNN, campaign spokesman Steve Wackowski said, "This is campaign season and there will be candidates and political operatives distorting Sen. Murkowski's record. Let me be clear, Alaskans are proud of Lisa's strong credentials as a conservative. We know where she stands; she has been fighting for Alaska to stop President Obama and the [Democrats'] meteoric growth of government and the national debt." Miller explained some of his positions to CNN. He said he hopes to repeal the recently passed health care legislation, claiming Alaska conservative voters "want it gone." Miller echoes a controversial position on Social Security, saying, "I mean there are a bunch of different proposals out there. And so for me to sit back and say, 'OK, I'm for privatizing Social Security,' I think that there needs to be a transition to that. It would have to be an orderly transition." And Miller said he would like to ax the nation's Department of Education. "I'm hard-pressed to find an enumerated power that authorizes it," he said. Yet Miller may have to defend against criticism that his positions are hollow. Andrew Halcro, a former Republican Alaskan lawmaker who previously served with Murkowski in the state Legislature and counts her as a friend, accused Miller of having "nothing else to offer than, 'The country is going to hell.' "
"I mean, he's just going to throw stones the next 60 days," said Halcro, who runs Halcro Strategies, a Republican political consulting firm. Regarding Murkowski's moderate positions, Miller and other critics often cite her vote for the financial bailout and her abortion-rights stance -- Halcro alluded to a Republican civil war that pits conservatives against moderates. "There's some people out there that want a 'purity test.' There are very few people who would pass," Halcro said. Amy Kremer, Tea Party Express director of grass-roots and coalitions, said that Murkowski is "one of the worst offenders in the GOP." Frank Gerjevic, editorial writer at the Anchorage Daily News, said he sees Murkowski being somewhat vulnerable to those arguments. But he questions the Tea Party's message. "What does the Tea Party offer? Apart from criticism, apart from the fear of socialism. Apart from, 'We have to get our country back?' " Gerjevic asked. "I think that's the kind of message that plays really well with Tea Party groups ... but I can't see many people up here looking at Lisa [Murkowski] and saying, 'Well, there's a socialist.' "
Gerjevic said, "I think she commands enough personal respect from folks." Gerjevic added that he "would not describe [Miller] as a fringe candidate. ... I see him as sort of a serious individual. But I guess, from this point, I don't see him having the traction or the chops of unseating Lisa [Murkowski]." Halcro insisted that Murkowski's middle-of-the-road stances will help her with voters. And he characterized the Tea Party as an "angry movement" using a tired strategy. "You have somebody to blame, you demonize the hell out of them and you hope it works," Halcro said. "I don't care how many buses, how many people, how many ads they run," Halcro said. "You get Joe Miller in these buses floating around town, you're going to see Alaskans recoil."